SINCE WE STARTED WORKING ON THE FISHUE, one name has continually come up in conversation. All the roads of sustainable seafood in the San Francisco Bay Area, it seems, lead to Kenny Belov. Belov was born Innokenty Belov in Moscow, Russia, in 1976, and moved to the United States at the age of five. An avid fisherman, mushroom hunter, and former professional photographer, Belov co-founded the sustainable seafood restaurant Fish in Sausalito, California, in 2004. Belov’s passion for the ocean has led him from fishing boats to restaurant kitchens, from aquaculture farms to warehouses, and from Seafood Watch to seeking the truth behind seafood labeling. 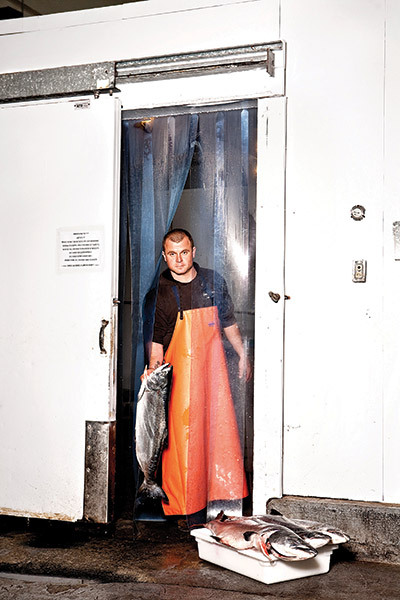 Belov co-owns TwoXSea, a retail company specializing in traceable, honestly sourced seafood; MacFarland Springs, a sustainable trout farm in California’s Lassen County; and a wholesale seafood company in Alaska. Meatpaper met with Belov and his daughter Isabella, aged seven, at the TwoXSea headquarters at San Francisco’s Pier 45. Tell me about your personal journey. You were doing photography before, and now you run four fish-related businesses. What led you to where you are now? I was always obsessed with fishing. In high school I moved to Florida and fell in love with saltwater fishing. I found myself in the Bay Area in ’96 and started fishing here on the sportfishing boats. In those days we were able to keep 15 rock cod, three ling cod. We were fishing in very, very deep water — 400 feet, 300 feet — and the fish were all coming up dead (when you bring them up from that depth, their swim bladders come out, so they are mostly dead). If the fish were not some magical size they just got discarded. The captain was OK with that because what kept the boat full the next day were the reports that were in the newspapers: how many pounds of fish the previous day’s trip caught. It was all based on the trophy. A handful of hours into the trip you would just look and see a sea of floaters. A couple of years later that entire area — Cordell Bank — was closed for rockfish. For me being out on the water was what I went out for; a fish was a bonus. I found myself wanting to work on these boats, and I finally got a job on a boat out of Berkeley. I didn’t last long because I was trying to convince the customers to keep stuff, and I was basically telling them the story that I just told you: Hey, you just killed this fish, it’s perfectly good, let me fillet it for you. That didn’t go over so well because the captain didn’t make money off of keeping small fish and reporting light catches. Fast-forward a few years: Two of my dear friends were getting ready to open this restaurant in Sausalito called Fish, and they said, “Hey, do you want to join in this project?” And after many sleepless nights my wife and I decided we were both still young enough that if we fell on our asses we could still get up. I had no restaurant experience. All I knew was how to cut fish, how to catch fish, and how to talk about local fish and my passion for fish. What was your role in the restaurant? At that point I was just the fish buyer and the fishmonger. Then on January 1 of 2006, the original owner offered me to buy into the restaurant and I accepted. Now it’s just the two of us — my partner, Bill Foss, and myself. Bill has been equally as passionate and dedicated to fixing this problem. We were one of the first restaurants that the Monterey Bay Aquarium said was a sustainable seafood restaurant. At that point we were following their rules to a T. But we were serving things that they recommended but that I disagreed with, so now we have pulled them off of our menu. I believe that the Monterey Bay Aquarium could be much stricter and make it a lot more challenging for chefs to really save the oceans; instead they make it really easy for chefs to write menus and deplete the oceans. They allow certain things that I believe should really be red-listed. It sounds like there is a problem with labeling and categorizing — even when you buy green-listed fish, it might not be what you think you have. Absolutely. There are also certain vessels and certain gear types within fisheries that are OK, but then the bulk of those fish are not caught with that gear type, yet somehow we all have it on our menus or in our retail cases. At what point did you go past the Monterey Bay Aquarium’s recommendations and start to think about it in your own terms? We are depleting the world’s oceans of anchovies and sardines to make trout, to make salmon, to make the fish that we as a society think are sexier on the plate. To make a typical pellet, you take a wet fish, meaning a wet sardine or a wet anchovy, and you dry it, you add bone meal, feather meal, chicken by-products, all sorts of other fillers. You compress it from six or eight pounds to make one pound of fish. We are depleting the world’s oceans of anchovies and sardines to make trout, to make salmon, to make the fish that we as a society think are sexier on the plate. The rest of the world has no problem with eating sardines and anchovies — it’s just this country that has a problem. So David was interested. He offered us a pen of fish and said, “You buy these fish, you can feed them whatever you want. If they all die, I’m still OK, and you’ve got a bunch of dead fish.” My partner contacted Dr. Rick Barrows, from the USDA’s fish research lab [Agricultural Research Service]. He is kind of like the guru of aqua feeds, and Rick was saying, “It’s not the ingredient list, all you are concerned about are the nutrients.” Trout don’t normally eat sardines, anchovies, and chicken by-products. Let’s make a diet more natural to the trout. What is a diet more natural to the trout? Some insects, and algae. So we took two strains of algae, and at that point we had 3% fish oil still left in, and no chicken by-products. That diet was working really well. But I wanted the fish oil out, too. We finally supplemented the fish oil with flax oil, and it worked super well, so we got rid of all animal products. Two algae, flax, flax oil. When we tested the fish, the omega-3s came back higher than wild salmon; omega-6s were nonexistent; PCBs and mercury were nonexistent. We started to get calls from the OB/ GYN community going, “This is the fish we need to be recommending, especially to moms!” and we said, “Wait a minute, you can’t do that because we don’t have enough of this fish.” If you make a statement like that in some sort of a medical journal that there’s this magical creature out there, it’s not scalable. Exactly. Until we can get a thousand farms to convert to a vegetarian diet, don’t go making some sort of statement like that, because we can barely produce enough fish for the immediate Bay Area. Aquaculture is not going to go away, but intelligent aquaculture is the only way that aquaculture can sustain us as a population because current aquaculture is a fuse and it’s going to go off. When we deplete the resource to feed the fish that we are farming, this false low price of seafood — farmed salmon at $4 a pound — it’s going to spike, and people are going to ask what happened. Can we sustain all aquaculture operations on a more sustainable diet? I think that you can sustain sturgeon, catfish, trout, tilapia, striped bass, and that’s about it. At what point did you take over the operation at MacFarland Springs? We bought it effective January 1 of this year. We produce about 170,000 pounds out of that one facility, if we’re running at maximum capacity. The farm has been there for a long time. How does it impact the local hydrology, and what do you do with waste products? There are things other than feed that are part of the sustainability of an operation like that. Absolutely. The water is streaming out of the side of a mountain. There are six raceways [fish runs]: three tiers, two on each side, and at the very bottom there’s a settling pond. All the waste settles in that pond. Then we pump it, and it goes into the meadow where David’s horses are. It makes a super-lush meadow. Everything runs on one little hydroelectric generator, and that runs the whole facility. No feeding machines — everything is hand-fed. It’s a very primitive operation, not a large-scale, automated facility. Is this the only fish farm that is actually sustainable? We have approached numerous people about using our diet and letting us do what we did with David. A lot of it is kind of back to where we started this conversation. The Monterey Bay Aquarium has given a lot of aquaculture the green light, so if you are already at the top, there is absolutely no incentive, so why would you change if you already make money and you are profitable? Because this feed costs us about $1.50 a pound, while conventional feed costs about 50 cents. Absolutely. If we could get more farms using algae-based diets it would bring the price of algae down, which is where the real big part of the cost is. What is sustainable seafood? What are the things that you need to consider, both for wild and farmed fish, to call it sustainable? For wild I believe that we need to give wild fisheries time to recover from our demand on food, meaning that we fish them in season, and then we allow them to recover out of season, and we use only sustainable gear. The gear should not take any by-catch that cannot be released unharmed. A trawl that’s fishing for California rockfish is killing everything between point A and point B. If we use sustainable gear methods, sustainable management of fisheries — meaning that we close them and open them for the best recovery rate of those fish, allowing them to spawn, allowing the areas to be closed for fishing when the spawning is happening — we can make sure the fishery stays healthy and abundant and supplies us with our demand for food. Aquaculture has got to be shore-based, medication-free, pollution-free — and the feed is the critical issue. If you have anything with a conversion rate of two-to-one you are already backwards. If you are two-to-one on something that is growing in the ocean, or eating hormone-fed chicken by-products, what have we really accomplished? You say that you can’t trust most distributors and a lot of restaurants to carry truly sustainable products. What’s your advice to the average consumer? My family and I do a lot of mushroom picking. When we first started, we learned one mushroom. After months of picking one, we learned another one. Then as the years went on, we learned more and more and more, and now the kids go. I recommend the same thing with seafood. What’s your favorite fish? Learn as much as you possibly can about that one fishery. YouTube is actually a great resource for watching underwater footage of different fishing gears. You can just watch and make a decision for yourself. Go to places like the Monterey Bay Aquarium and use that as a starting point. Do they say red, yellow, or green? OK, so your favorite fish is red — why? If it’s being caught with a certain gear, try to find anybody who catches it a different way. Is it possible to catch it a different way? Call the aquarium. Here at TwoXSea, how do you make sure that what you are getting is what you think it is? Because I only buy it from the boat. The supply chain is the problem. We all go to farmers’ markets. Likewise, if the wholesaler can buy directly from the fisherman, or if the restaurant can buy from the wholesaler that’s buying directly from the fisherman, then you have more of a localized menu. So it sounds like as a consumer the best thing to do is to actually know your producer, to know which boat your fish comes from. Sure. Know the restaurant you like to eat at, ask questions, and demand answers. If they claim it’s wild, don’t take that for an answer. Ask, “How do you know it’s wild? How does your producer know that it’s wild?” The best thing is vote with your fork, vote with your wallet. If chefs put something on the menu that doesn’t sell, they are going to stop putting it on the menu. VIOLA TONIOLO is an ecologist, writer, photographer, and mapmaker based in San Francisco. She was born and raised in Italy and hails from a food-obsessed family. She is happiest when her feet are on bare rock and her sights are set on something distant – preferably an iceberg, a seal, the ocean, or the next mountaintop. Photographer JULIO DUFFOO was born in Peru and raised in Brooklyn, and is now based in San Francisco. He has photographed people who spend their lives engaged with meat for every issue of Meatpaper since Issue One.